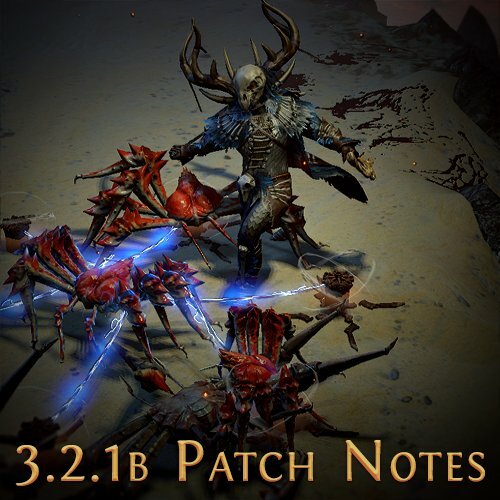 As announced yesterday, the Path of Exile developers are working hard on the next patch and hope to release Update 3.2.1B today or tomorrow. The patch notes are already there and tell us the details of what has actually changed. Rare (yellow) beasts now encounter you more often in the Path of Exile Bestiary league and also bring more loot, but they have also gained in balance at the life points. Which is an advantage in this case, as it gives you enough time to catch a net before the poor beast is destroyed by too much damage. In addition, there are 3 new recipes for the Beastcrafting and the components for "Create a Six-link Armour" Beastcrafting have been corrected. The interface for the Blood Altar UI has also got the same new sorting and filtering functions. So looks for which other recipes the selected beast is still needed. Yesterday we gave you an overview of what we are currently working on and that with Patch 3.2.1b further improvements to the Bestiary league will be made. In the meantime, you can already watch the patch notes. Rare Bestiary Beasts now spawn more often, have more health and drop more items with increased rarity. Added 3 Beastcrafting Recipes. These create Unique Talismans, Orbs of Horizons and Harbinger's Orbs. Corrected some recipe components for the "Create a Six-link Armour" Beastcrafting recipes. You can now select which beast you want to use a Bestiary Orb on through your Bestiary's Captured Beasts list. You can now filter by Name, Level, Family, Group and Genus in the Recipes page in the Bestiary as well as in the Blood Altar UI. Hovering over a Beast in the Bestiary or the Blood Altar UI will display a list of recipes that the Beast is used in. Disabled the ability to capture Beasts which had the 'Heralds of the Obelisk' or 'Bearers of the Guardian' bloodlines mods, as this could result in unintended behaviour. When Corpse Targeting is set to 'Always Enabled', and you have a Necromancy Net selected, mousing over a Beast corpse now always highlights it. Fixed a bug introduced in 3.2.0 that changed the level requirement of Night's Hold to 40, rather than 25. Fixed a bug where Vaal Clarity removed the reservation cost of Auras. Fixed a bug where Fenumus, First of the Night could become untargetable after retreating to its cave. Fixed a bug where Brinecrack could get stuck underground if you attempted to capture it as it was burrowing. Fixed a bug where the Bestiary UI would display "Loading...", rather than a blank page, if you changed areas while having no captured Beasts. Fixed a bug where Strongboxes whose mods had changed through currency use would display mods that it no longer had when using 'Advanced Mod Descriptions'. Fixed a bug where the lighting in the Haku mission area 'Haunted Residence' was darker than intended. Fixed a bug where plaques for Giant Arachnids displayed "????????" in the Menagerie. A new outfit has also been released, the preview of the Seawitch Armour Set can be found at the beginning of the article.